We’ve been working through the Wisdom Literature this season. We’ve hit on the book of Psalms as well as Proverbs and now it’s Ecclesiastes’ turn! What do VH-1 Behind the Music and Ecclesiastes have in common? 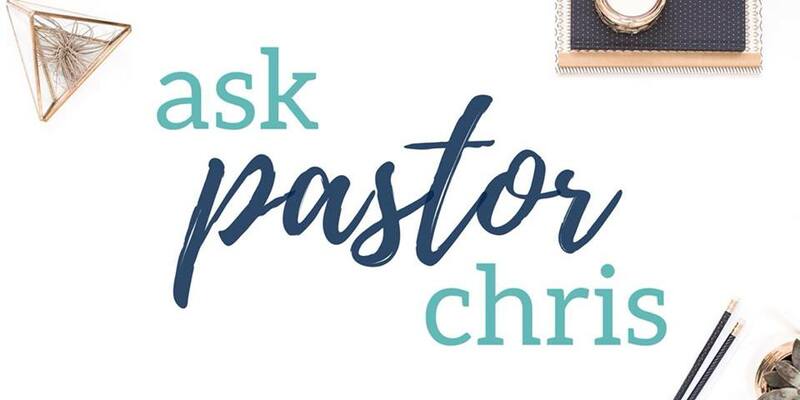 Chris explains in this week’s podcast. 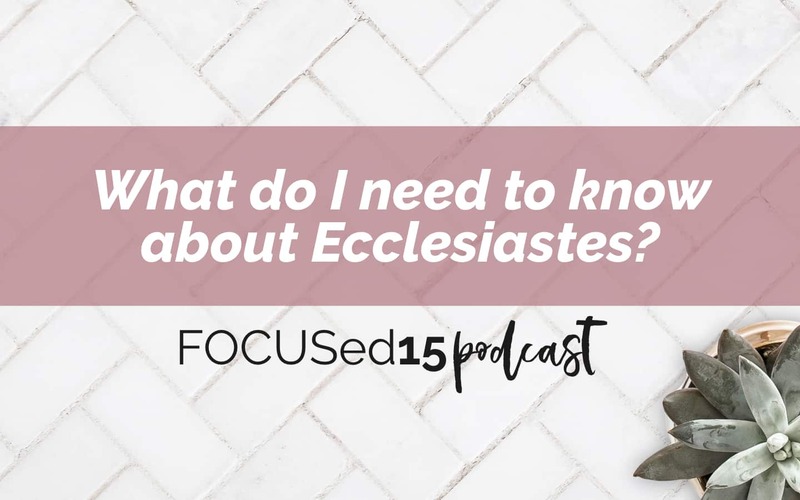 The AUTHOR, AUDIENCE, and AIM of Ecclesiastes. The similarities between VH-1’s Behind the Music and the book of Ecclesiastes. The main themes in the book. How a meals at Denny’s and Ecclesiastes led Katie to marry Chris. ESV Study Bible – A great resource for any book of the Bible. Includes all the basic info you would need to know about a book (author, audience, aim) and more. 1. Listen right here on the blog. Just click the little play button at the end of this post or watch the Facebook Live video version. 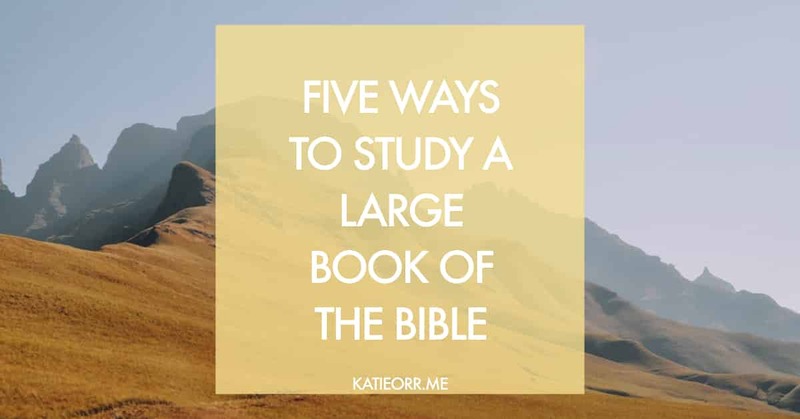 https://katieorr.me/wp-content/uploads/2017/08/taking-Bible-literally-1.jpeg 900 1440 Katie https://katieorr.me/wp-content/uploads/2018/11/bible-study-for-women-6-1.png Katie2017-12-04 04:16:262019-04-01 11:46:25What do I need to know about Ecclesiastes? 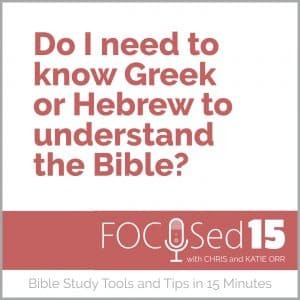 There are two needed viewpoints when it comes to Bible study. The one I most often talk about and love to teach people how to use is what I liken to Disney’s A Bug’s Life movie. Seeing the world at that zoomed-in perspective allows us to see details that cannot be enjoyed at a normal vantage point. However, there is another important perspective we can use to study I like to refer to as the “bird’s-eye-view.” If you’ve flown on a plane and enjoyed a window seat, you know a new appreciation and knowledge of a city can be gained by viewing it at that altitude. You can see the structure and order (or lack of order) in the way the roads are situated, and how the city moves along the river, mountain, and/or other prominent features. As I get ready to approach the Psalter once again—in view of diving deeper into a select few—I want to be able to see the collection of Psalms as a whole. 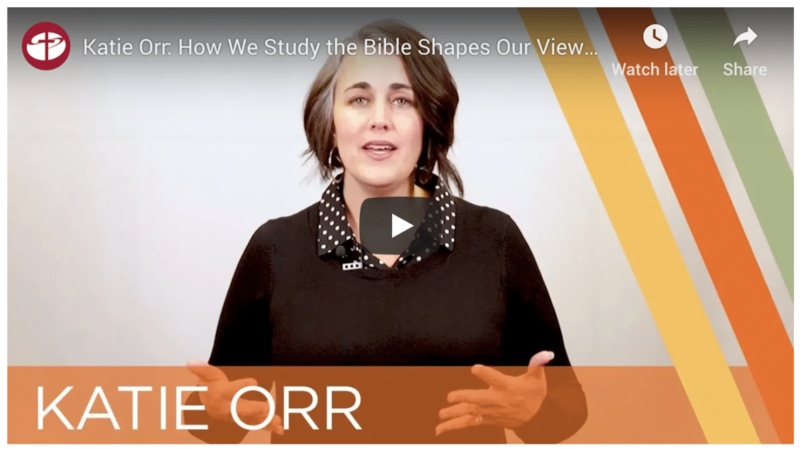 In general, this is a great practice to incorporate into preparation for any deep study, especially if you are not super-familiar with the big picture of that portion of Scripture. Even if it is familiar territory, there is typically more to see and enjoy on every subsequent trip through the Bible. I brainstormed several options for this bird’s-eye journey through Psalms. 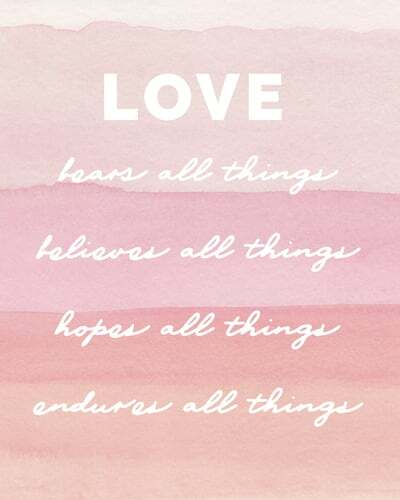 These can also be used for another other large portion of Scripture. How do I study a large passage of Scripture? Here are five ways to approach a large section of the Bible. 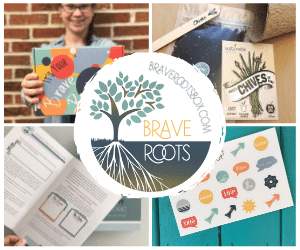 Any one of these would be great way to get an overview of a book of the Bible. 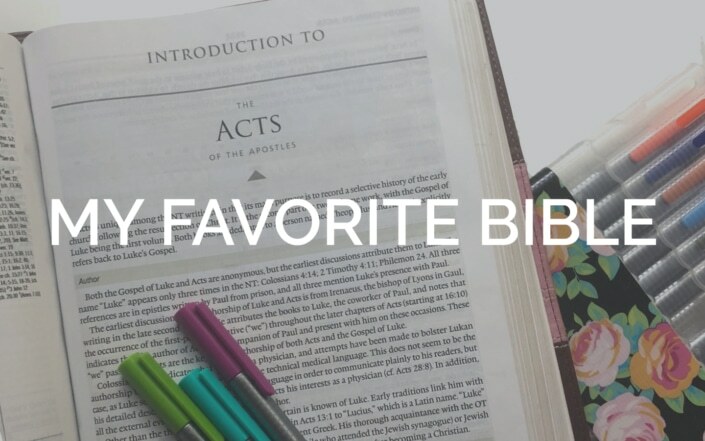 You might start with the Psalms, Acts, any of the Gospels (Matthew, Mark, Luke, and John), for a new perspective on more familiar territory, or give yourself a challenge and use this through one of the major Prophets (Isaiah, Jeremiah, etc. ), Revelation, or Old Testament Narratives (Genesis, Exodus, Ruth, Judges, etc.). Read and Underline – Grab a reading plan and a pen or Bible highlighter, and just mark anything that stands out to you. Recommended Resource: I LOVE these Micron pens for writing in my Bible (affiliate link). Read and Write – This is a great way to slow down and enjoy each word. If you don’t have time to write out the entire passage you plan to read, just pick out one or two verses from the day’s passage and write them out in your journal. Read and Pray – Turn the words on the page into a prayer as you read. When you come across a truth about God, praise Him for who He is. If you find a command, proclaim a resolve to follow it and invite the Holy Spirit to enable you to obey. When the author records his own prayer or godly desires, agree with it in your heart, or consider writing it out in your own words as a cry of your own soul. 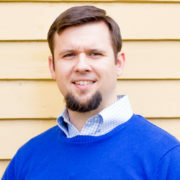 Recommended Resource: Praying the Bible (affiliate link) by Donald Whitney. Character of God – Who is God? What does He do? 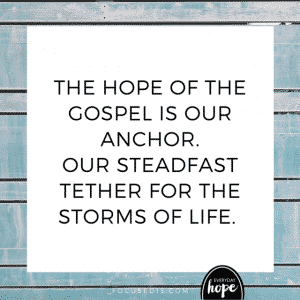 Covenant promises – What about God and the good news of the gospel can I cling to? Commands to keep – Are there any attitudes and/or actions to adopt and/or avoid? Read and Memorize – The memorization part will most likely carry on for much longer than the period of time in takes you to read through the passage. However, memorizing key portions of a book of the Bible can really unlock the meaning of the rest of the book. 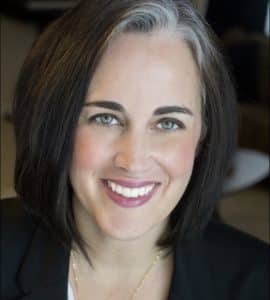 For example, I memorized Romans 8 several years back and anytime I read or study parts of Romans, I tend to see the important connections to the truths expounded on in chapter 8. Consider trying one (or all) of these out on a smaller book of the Bible first. This will give you a better idea for how long it will take you to get through a larger book, as well as let you see which is most enjoyable to you. We all learn differently. Find what works for you. Tweak it. Make it your own. Have you studying an entire book at one time? If not, which would you like to? If you have studied a book like this, which one did you go through? How long did it take? What was your experience like? One of the excuses I often hear (and have given myself!) 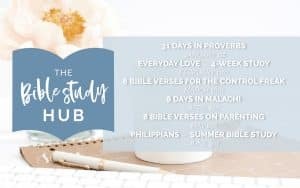 for women not spending time in the Bible is: “I’m too busy for Bible study.” Truly, you and I know this is not quite true. We all have discretionary time—we just don’t always use that time as well as we could. Life is a journey, and so is the road to consistent time in the Bible. One of the biggest hurdles to staying in the Bible is NOT busyness, but it IS lack of a habit. If we can develop a routine that includes Bible study—even if it is just minutes a day—we will reap the benefits of a deeper walk with Christ. 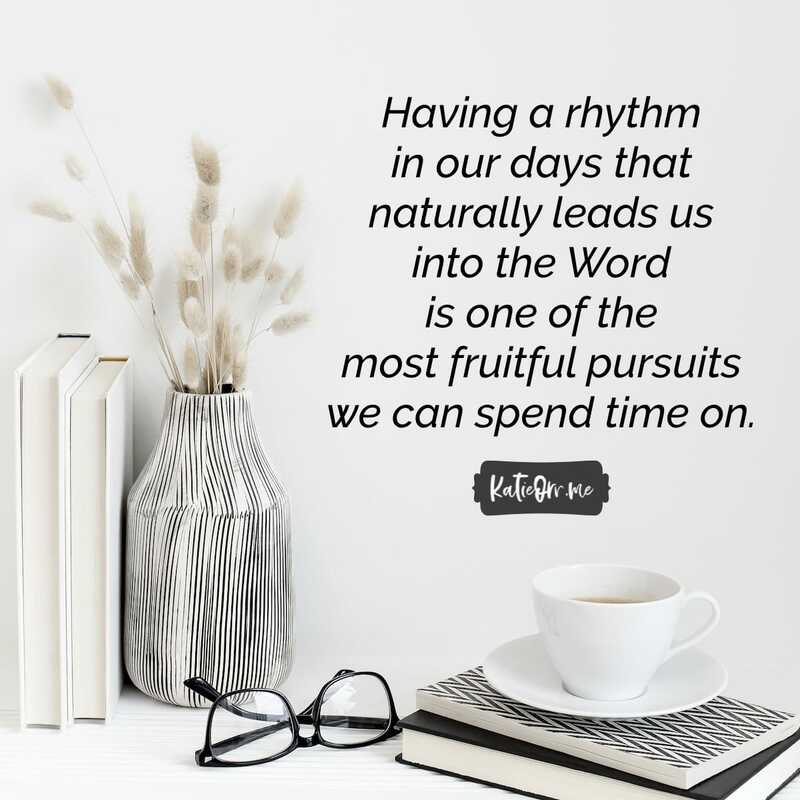 Having a rhythm in our days that naturally leads us into the Word is one of the most fruitful pursuits we can spend time on. I’ve found one such fruit of establishing a Bible study habit is a greater HUNGER for more time in the Word and a deeper DESIRE for meaningful Bible study. 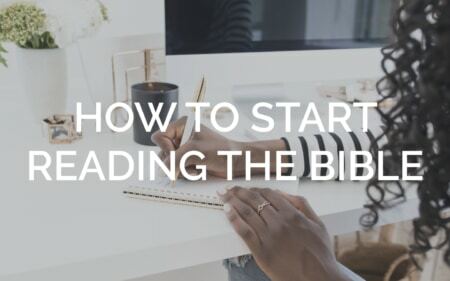 Here are three tips that have helped me in establishing (and keeping) a regular time for Bible reading, study, and memorization. Find a trigger. When I have coffee, then I read my Bible. That’s my trigger. Instead of trying to make 6 AM or 11PM my hard and fast quiet time, I’ve had much more success in folding Bible study into the rhythm of my day. So whether I wake up at 7 AM or slept in until noon, my Bible study is part of my morning routine. Find a space. Once you carve out time to sit and study, it’s helpful to have everything ready and waiting in an inviting place for you to start. This will help keep you from wasting time looking for a pen or your Bible. Whether it be an armchair in your bedroom or the living room sofa, have a basket or drawer filled with all you might need to spend time with God. If you have multiple copies, consider designating one Bible for this space and another for Sunday morning sermon notes. I have a Sunday bag that has everything I need for the service, including my journal Bible which I only use for that time. This frees me up to have other resources handy on the shelf near my “quiet time” space in my home office. Find a group. This is especially helpful if you are trying to build momentum and need accountability and encouragement. The first few weeks of a new habit are always the most difficult, and groups—whether they’ve been online or in “real life”—have been just the catalyst I’ve needed to keep going after the excitement wears off on day two of my endeavor. If we can develop a routine that includes Bible study—even if it is just minutes a day—we will reap the benefits of a deeper walk with Christ. What has been helpful for you when establishing a routine for your quiet time with God?